It rains in Vrndavana. The Vrndavana rains are purifying. Maharaja pops his head into the bus apologising for the weather and the delay, and announces a change of plans. Today we will go to Govardhana. Jai Giriraj! The famous sandstone domes of Kusum Sarova come into vision. A bustle of pilgrims in the parikrama path intermingle with monkeys, cows, rickshaws and mobile sugar cane juice stalls but we leave the hustle for the highest platform: the porch outside the memorial temple built by the Jat kings from Bharatpur. They had defended Vrndavana from the mogul attack. “Devotees sacrificed their lives to protect devotees,” Maharaja said. Our large group spills into the shade temple. The resident priest opens its doors to create more space but Maharaja stays on the porch where he can gaze out at the deep waters in the Vrndavana morning sun. He needs the vitamin D, is what he keeps saying. Instantaneously, there are gifts! Mahaprasadam from Udhhava’s temple and an impressive Radha Kunjabihari gift pack from the adjacent temple. A gentle breeze carries the mangalacaran as it echoes off the sandstone. “So peaceful in the morning at Kusum Sarovar. 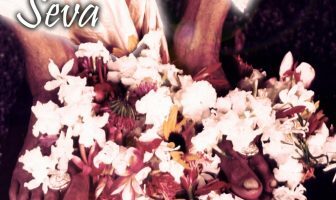 Here, the gopis collect flowers and Srimati Radharani makes her vaijayanti garland that falls below Krsna’s knee with five types of flowers in a different arrangement each day.” The ever-fresh nature of Vrndavana. With the change in the parikrama schedule, Maharaja has to shift his meditation which had been “all Nrsimha Nrsimha” to Govardhana. Finally it rests at a firm favourite of his: Uddhava. Uddhava was Krsna’s cousin and close friend, so much so that he even looked like Krsna and they had their own code language. However, the main purpose of Uddhava’s existence was to be a messenger; first to the gopis and then later he would carry the message of the Uddhava Gita when Krsna left. Yet this purpose was not very clear in the beginning. Maharaja made a parallel with his own life and how he thought that he would spend his entire life serving in Vrndavana. “You can’t have it all mapped out in the beginning. 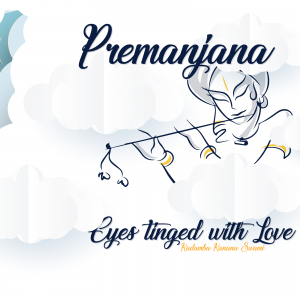 Krsna’s plan unfolds…there will be surprises on the way.” Another messenger, I thought. He retells the metaphor that compares our life to a house. We expect Krsna to come in and make some changes to make it better for us to live in but lately Krsna is tearing the whole house apart and rebuilding it so that he can live there. 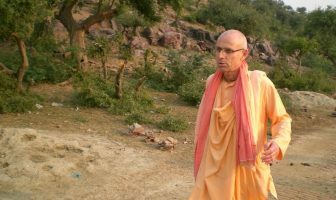 His second meditation: Was Uddhava was an outsider in Vrndavana? 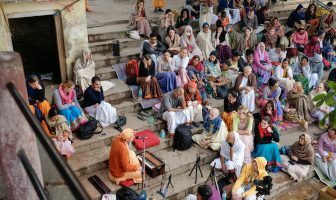 And what are we doing in Vrndavana? Do we belong here amidst all this devotion? Yet it was Uddhava’s desire that took him to Vrndavana. Maharaja zones in on the point that it is only our lack of desire that makes spiritual life an austerity. We stop at the Uddhava temple to take darshan of the blue hued Uddhava with the Bhagavatam in hand and then pause at the banks of the kund for breakfast with gentle splatters of rain, before setting off again. We pause for a quick darshan of Sri Sri Radha Kunjabihari – very sweet silas of Radha and Krsna. This is where Krsna plaits Srimati Radharani’s hair and she holds up a mirror to see him. Crossing the road, we reach Narada-kund which houses a life-sized brass deity of Krsna sitting cross-legged and Srimati Radharani looking at him, with her arm on his. Narada-kund is a large green expanse of water with sandy banks and tall trees that stoop to touch the sacred water. After dipping into Kusum Sarova and emerging in a gopi form to enter into the rasa lila, Narada resided here to write the Narada Bhakti Sutra. 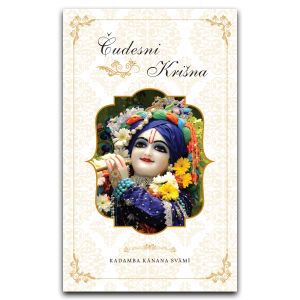 It is a book that Srila Prabhupada began translating and Satsvarupa Maharaja finished. Maharaja reads the words of Narada on the basic but essential definitions of bhakti. An important principle that Maharaja inculcates is that when we come to the holy places we should offer something because we cannot come to Vrndavana with the mood of just taking. Just as his mother often said, “Never leave the room empty handed.” (Carry some dishes out) Similarly we should not go to a temple empty handed. Onward towards the markets of Govardhana, we go to Manasi Ganga. 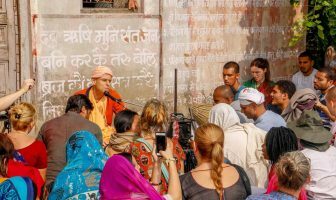 As gaudiya vaishnavas, we offer our obeisances at Sanatana Goswami’s bhajan kutir before briefly settling at the stairs of the Haridev temple. It has been a pleasant change of plans with stolen glances of Sri Govardhana.